RIFCON is a unique think tank set up to address the issue of Riba that has engulfed and impoverished the world today. Riba’ is seen to be at the crux of all major human problems of current times, imprisoning and enslaving human beings through a crafty use socio-politico-economic and financial system. RIFCON stands for RibaFree Economy. We call upon all responsible citizens of the world to embrace RIFCON. The struggle against Ribais a continuous and gargantuan task but for us, we trust that “A journey of a thousand miles begins with a single step.”RIFCON began in November 2010 through the convening of the 1st World Conference on Riba. The conference unanimously agreed that the world needs to better understand Riba. This was further agreed upon by the participants of the 2nd World Conference on Riba held in July 2011 and the call to setup a think tank to research the subject of Riba’ grew louder. Hence, the birth of RIFCON.net. RIFCON seeks to foster progressive and constructive relationship with the world community. We aspire to generate awareness among the public on the ill-effects of Riba through continuous research and education whilst concurrently providing authorities, governments and policy makers with remedies and solutions that are just, practical and sustainable. NOTE: This article is originally published at this website: http://www.rifcon.net/?page_id=13 and there are plenty more articles re: "riba" also. 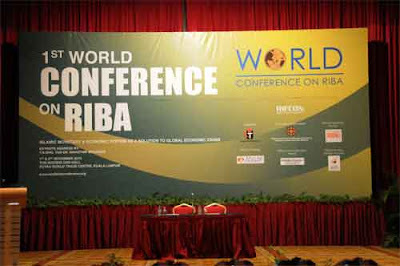 NOTE: The 3rd World Conference on Riba is scheduled for November 26 & 27, 2012 with this subtitle: "The Multifaceted Global Crises of Riba’: Resilience, Response & Reform" and it takes place at the Palace of Golden Horses, Mines Wellness City, Kuala Lumpur. Malaysia.